TBILISI, DFWatch–Non-governmental organizations (NGOs) in Georgia criticize the government for not doing enough to eliminate discrimination of religious minorities, and underline that over the last two years, the country has seen a number of conflicts on a religious background. Incidents involving religious, ethnic and sexual minorities is one of the problems highlighted in the 150 pages long report, which also deals with topics like the executive and the legislative, the court system, prison system, judiciary and other issues. Fifteen Georgia-based NGOs have worked on the report, which is an assessment of the two years under the Georgian Dream government. They found that the government did not properly respond to religious conflicts, and the inadequate response has ‘fostered intolerance.’ Some of the cases include conflicts in Nigvziani, Tsintskaro, Samtatskaro, Chela, Kobuleti, Mokhe. 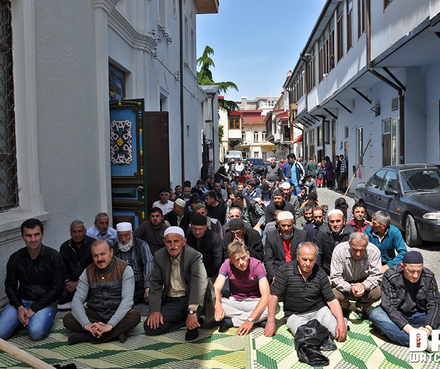 In some of these cases, there is still not a solution, for example the dispute surrounding a mosque in Mokhe. There were at least six complicated conflicts against Georgian Muslim community in this period. “However, governmental policy has not been effective in any of those cases,” the report reads. The Interior Ministry did not react timely and effectively, but had a role of ‘passive monitor,’ it continues. On the other hand, law enforcement bodies are failing to conduct an effective investigation in for example the conflicts in Nigvziani and Samtatskaro, where there still is no solution today. Furthermore, the NGOs accuse the Interior Ministry of conducting a repressive policy towards religious minorities, giving as examples Chela and Mokhe, both places where the police illegally detained members of the Muslim community. When it comes to the Jehovah’s Witnesses, there were cases of violence against them also the recent two years: in 2013 there were 53 such incidents, while in 2014 there were 64. A recent case took place in Terjola, where Jehovah’s Witnesses are not allowed to build a prayer house, called a Kingdom Hall. The case is one example of local governments failing to allow religious minorities to construct prayer houses. Usually, this is the result of protest by locals, who are Orthodox Christians, which is the dominant religion in Georgia. Local governments delay the process of granting building permit or create other barriers for minorities. The chapter about sexual minorities describes the violence of May 17, 2013, when tens of thousands of religious radicals attacked a gathering of not more than 30 people who wanted to conduct a peaceful rally to mark the day against homophobia. The following year they were not able to express their opinions because of fear that the police would not be able to guarantee their safety. Meanwhile, May 17 had been declared a day of ‘family purity’ by the head of the Orthodox Church. But apart from May 17, and number of issues surrounding this day, the report describes further problems, for example bullying in schools because of the sexual orientation, violence in the streets or families, while doctors, lawyers and other professionals are rejecting LGBT people, denying them services because of their orientation. Police are again accused of being inactive in protecting the rights of minorities, especially transgender people. Not only are the not protecting them, but police are openly expressing homophobic views, and law enforcement bodies still fail to investigate cases of violence against sexual minorities.